The Accounts Payable module is a direct extension of purchasing and receipt of goods. It manages all accounting procedures related to the vendor, from the recording of vendor invoices, to the preparation and execution of payment (by check or bank transfer), aging, shipping expense distribution (over part costs) and (in the dual-currency package only) the handling of import expenses. A broad spectrum of reports is included in this module, which allow for the analysis of purchasing expenses from different perspectives (by vendor, by part). The distinction between this module and the Purchasing and Inventory modules is merely a logical one. In practice, there is a constant flow of data between the modules. For instance, invoices can be generated on the basis of unpaid goods receiving vouchers (thereby updating outstanding balances), or they can record the receipt of goods as well as payment due (combining an inventory transaction with a financial one), on the basis of a purchase order. Similarly, financial data can flow to the purchasing department — for example, in regard to outstanding debts and payment balances. In the same manner, financial transactions that transpire in the Accounts Payable module directly affect data in the general ledger: the recording of an invoice, check payment or bank transfer automatically creates a journal entry, which can then be authorized and posted with the push of a button, or posted automatically. These journal entries then further affect additional processes in the Financials module, such as: cash flow forecasts, projected profit and loss, budget analysis, and the like. Invoices received from vendors can be automatically recorded on the basis of purchase orders and/or goods receiving vouchers (GRVs). This linkage allows for the automatic retrieval of data, such as prices and discounts, payment terms, order balances, and received quantities. In the case of an invoice that doubles as a GRV (i.e., a “vendor invoice”), received quantities are compared to the order balance, taking into consideration the defined order tolerance. These features provide important controls for preventing errors (in terms of quantities, prices and discounts), while eliminating the need to retype existing data. The price source of each item is displayed in the invoice, as is an electronic signature. In addition, debit memos to vendors can be prepared automatically in the event of an overcharge. Until an invoice has been approved, it is considered pending and may be revised or deleted. Any invoice can be flagged as “being checked,” which prevents it from accidentally being finalized before the check has been completed. Once authorized and finalized, a journal entry is recorded, with sums distributed amongst accounts in keeping with the designated entry code. If errors are discovered after the invoice has been finalized, a cancellation invoice can be created, which both cancels out the original document and creates a reversing journal entry. (If the invoice doubles as a goods receiving voucher, a reversing inventory transaction is created as well.) All this is achieved by a simple mouse click from the invoice form. You have the choice of canceling on today’s date (i.e., the cancellation invoice and its accompanying reversing entry are dated on the current date) or on the original transaction date. If necessary, you can prevent the preparation of payments for a given vendor or for a specific purchase invoice. In the latter case, the invoice may be recorded in the ledger, whereas payment is blocked. Priority provides a number of methods for distributing the costs of shipping, storage and the like (including customs duty in the dual-currency package) over the cost of purchased materials. If these indirect costs are billed in the same invoice as the purchases, the former are distributed over the latter. Another option is to assign a fixed percentage of the part cost and calculate that as the average indirect cost. This is particularly useful until an actual invoice is received for these additional expenses. When expenses are recorded in separate invoices (e.g., from different vendors), they can be attached to purchases via a shipping voucher. An Expense Invoice Work Area allows you to quickly prepare single-item expense invoices. The system also supports the recording of invoices for a general one-time vendor. All one-time vendors are assigned a general account (shared by all vendors who do not have their own A/P account), eliminating the need to open a new account every time a purchase is made from such a vendor. The actual vendor’s name and other identifying information are recorded directly in the invoice, while the journal entry associated with the transaction is recorded against the general walk-in account in the accounts payable sub-ledger. • As a multi-GRV invoice (which bills several shipments simultaneously). Each type of invoice is explained in detail below. Vendor invoices combine two functions: invoicing and receiving. In this way, you document both the billing and the receipt of goods themselves (eliminating the need to record a separate goods receiving voucher). Once the transaction is documented, inventory levels are updated for the received parts. Vendor invoices may be itemized automatically on the basis of one or more purchase orders, or they may be recorded manually. If based on a purchase order, the invoice is filled in with the ordered parts, the balance to be received, prices, discounts and payment terms — all taken from the designated order. If order prices are linked to a price index or foreign currency, prices in the invoice are adjusted accordingly. All of these details may be manually revised as long as the invoice is still pending (i.e., has not been finalized). Vendor invoices can include prices in currencies other than the customer’s billing currency, even when the latter is a foreign currency (all sums are converted automatically to the customer’s billing currency when entered in the journal). Received quantities are checked against the order balance, taking into consideration the defined percentage of order tolerance. If the check succeeds, the quantities of items in the invoice are based on the order item’s balance to be received, and that balance is updated accordingly (as are warehouse levels of the received parts). Each received part is assigned its pre-determined entry status (designated per part). The receipt of parts with serial numbers is tracked as in a regular receiving document). If the invoice is not based on an order (and has therefore been itemized manually), prices and discounts are filled in automatically with those ordinarily afforded by this vendor, using the same method applied in regular goods receiving vouchers. which are deducted from the total amount owing in the invoice. 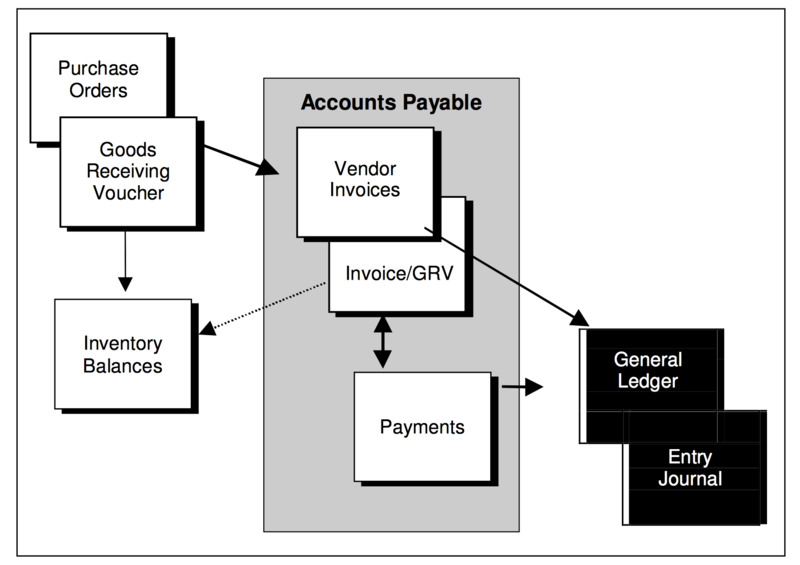 Note that the creation of a multi-GRV invoice has no effect on warehouse balances, in contrast to vendor invoices. A multi-GRV invoice can be recorded on the basis of a single goods receiving voucher (GRV); all receipts of goods over the course of a specified period; or a number of specific GRVs. Multi-GRV invoices can be itemized automatically by linking them to one or more goods receiving vouchers. Consequently, parts and quantities are taken from the vouchers (with returns in negative quantities). Additional items may be recorded as well. Prices are based on the appropriate purchase price, unless the designated GRV was linked to a purchase order; in that case, the order number is filled in and prices are taken from the order. If order prices are linked to a price index or foreign currency, prices in the invoice are adjusted. At any rate, prices and quantities can be manually revised. The multi-GRV invoice can also be itemized manually. • If you have received a credit memo from the vendor, you can record a copy of that memo. • If you have received credit within an invoice, you can record the credit (using negative amounts) in the copy of the invoice that you enter into the system. In the event of overcharging or the return of goods to a vendor, it is possible to record a copy of the credit memo sent by the vendor. These memos do not update inventory balances. Therefore, if goods have been returned, the credit memo must be accompanied by a return document (which revises warehouse levels accordingly). You can itemize a credit memo for returned goods automatically by basing it on a return to vendor document. You can use a vendor invoice to record returns by designating negative quantities. If the return is for all of the received goods, this can serve as a cancellation invoice; by linking it to the original invoice, the two are reconciled automatically. Consequently, the original (now canceled) invoice ceases to appear in outstanding debt reports. You can also initiate a memo that debits the vendor for returns of goods or for overcharging (as opposed to credit awarded by the vendor). The memo can be itemized automatically by linking it to a return to vendor document (in case of returns) or a multi-GRV invoice (in case of overcharging). You can also open a debit memo manually. When the debit memo corrects for overcharging in a recorded multi-GRV invoice (identified by its internal invoice number), it is automatically itemized with all the parts for which there was a discrepancy between the order and the invoice — in terms of price, discount or quantity. Priority offers two options for recording payments to vendors: check payments and bank transfers. Payments may be made against specific invoices or they may be unrelated to any particular invoice. They can be prepared automatically in batches or manually per payment document (see below). Once the payment has been checked, authorized and finalized, a journal entry is created that credits the vendor’s account. Consequently, the invoices for which the payment is being made are automatically reconciled with the payment. Checks and bank transfer instructions can be printed once payment has been finalized. 1. Flagging the outstanding invoices to be paid. 2. Designating partial payments (where applicable). 3. Preparing the payment documents. 4. Printing the checks or bank transfer notices. Invoices can be flagged for payment either manually or automatically. When working manually, you select the desired invoices from a list of outstanding invoices (i.e., those which have not yet been reconciled with payments). Automatic flagging is carried out separately for each vendor. A special program allows you to flag all outstanding invoices from the vendor in question, which are due up to a specified payment date (or recorded up to a specified invoice date). You can revise results by flagging additional invoices and/or deleting flags that were inserted automatically. You can also flag other transactions recorded against the vendor’s account, such as previously unapplied payments and debit memos. If payment is due in instalments, each payment date appears on a separate line and can be flagged individually. If you wish to perform a partial payment for an invoice due in a lump sum, simply use the sub-level form to split the payment, specifying each payment amount and the remittance date on a separate line. Or you can use the same form to designate a partial amount to be paid now. The invoice in question continues to be considered outstanding until full payment has been made. The next time that you prepare a payment for this invoice, any partial payment(s) that have already been recorded will appear in the Previous Payments for Invoice form. Once the invoices that require payment have been flagged (together with unused credits), payment documents can be opened automatically for each vendor. If you wish, you can request payments due in the future to be postdated; these will be recorded in separate payment documents dated on the (future) due date. All other payments will be dated on the current day (or any other user-designated date). After indicating the bank account from which payments will be remitted, you choose the means of payment via a pop-up menu (either Check or Bank Transfer). The appropriate payment documents are consequently created. The total payment per vendor is determined automatically by the sum of the amounts owed less the total amount of credit. Payments can also be prepared manually by entering the Check Payments form or the Payments by Bank Transfer form. Invoices for payment can be flagged or recorded directly into the relevant sub-level form. You can also record partial payment of any invoice. Check payments or bank transfer payments that are not connected to a recorded invoice (or pre-payments made prior to the recording of a regular invoice) can be manually prepared. Regardless of how it was prepared, once the payment document has been checked, authorized and finalized, a journal entry will be opened debiting the vendor and crediting your bank account. In the dual-currency package, withholding tax is calculated for each vendor (assuming that tax percentages and exemptions have been properly assigned). When payment is finalized, the journal entry not only debits the vendor and credit your bank account, but also credits the withholding tax account. Priority offers you the option of printing checks to vendors. This mechanism in question ensures that you can only print those checks that appear in finalized payment documents and which have not yet been printed. The program enables the user to select the maximum number of checks to print at any one time (useful, for instance, when there are only five checks left in the printer whereas there are ten that need to be printed). The program also displays the number of the next check to be printed. If the latter does not tally with the first number on the checks in the printer, it may be revised. One of the financial constants determines the number of check copies that can be printed at any given time, while another determines the maximum number of characters that fit on a single line of a check. • A letter of notification to the vendor that his/her account has been credited as a result of the bank transfer. The letter includes details of the transfer, as well as details of the invoices covered by the payment (including any debited sums). • A notice to your bank, requesting that funds be transferred to the vendor. The notice includes the details of the account being debited, the amount (both in digits and written out), and the vendor’s account to be credited. Priority offers a mechanism for withholding taxes when paying vendors, supplemented by a set of withholding tax reports. You can define both a maximum percentage of withholding tax (applicable to most vendors) and, for vendors with partial or full exemptions, the (lower) percentage to be withheld as well as the date on which authorization for this special treatment expires. You can also create an account to be credited when tax is withheld. When taxes are withheld from vendors, a journal entry is recorded that credits the designated withholding tax account. • Missing Data for Withhd Tax Rep.
• Determining costs by means of a shipping voucher (which combines all relevant invoices of purchased parts and expenses). While the first method provides a relatively clear picture of added shipping expenses, in certain circumstances such a calculated cost will be unsatisfactory, as other factors (e.g., the size and contents of the shipment) play a role as well. In such cases, a shipping voucher is used instead. In fact, you can utilize both methods: recording the cost of the received goods according to the designated fixed percentage in the initial stage, reducing the distortion of the part’s cost, and then using a shipping voucher when all the charges related to the shipment and import of the goods have been received. In fact, Priority’s cost analysis mechanism takes such updates into account even when they refer to a previous fiscal period. In the dual-currency package, the same mechanisms can be used for distributing import expenses (e.g., customs duty). When you work with a fixed percentage, the part’s additional expenses are calculated as a proportion of the purchase price. For instance, if the average cost of a shipped part is 10% of the part price, and the part costs $100 in a given receipt, then an additional $10 will be added to its cost in this particular transaction. Average shipping costs are designated per vendor and part, for each method of shipping (air, land and sea). When this mechanism is used, the cost recorded against the receiving transaction (usually a goods receiving voucher) consists of the purchase price plus the added percentage for additional costs. The purchase price is taken from the vendor’s invoice (if it has been received) or from the purchase order (if it has not). Shipping vouchers allow additional charges related to the shipping and importing of goods to be linked to vendor invoices and thereby attached to specific purchased parts. For example, you can attach an invoice received from a duty agent or shipping company (billing for such expenses as import fees, shipping charges, insurance premiums, storage space, port taxes) to one or more invoices billing the purchase. • Price – Expenses are distributed among purchased parts based on the extended price of each part relative to the total price of the shipment. • Quantity – Expenses are distributed according to the quantity of purchased parts; this method is only advisable for parts measured in the same unit. • Volume – Expenses are distributed by multiplying the unit volume by the quantity of purchased parts, relative to the total volume of the shipment. • Weight – Expenses are distributed by multiplying the unit weight by the quantity of purchased parts, relative to the total weight of the shipment. Once the shipping voucher is finalized, actual part costs for each shipped item are calculated and attached to the receiving transaction. This method provides a more precise picture of the actual costs for each shipment. In the dual-currency package, Priority allows you to maintain bonded warehouses and track inventory transactions into or out of such warehouses via shipping vouchers. The cost of receiving goods into inventory is calculated separately for each partial release of goods from the bonded warehouse. This calculation takes into account the cost of storage in the bonded warehouse and any additional costs connected with the release of the goods (e.g., import duty), in addition to the import costs, such as shipping, that preceded the entry of the goods into the bonded warehouse. Priority includes a variety of reports on outstanding debts to vendors and aged payables. Some reports summarize the amount owed to each vendor; the more detailed reports list outstanding or partially paid invoices. • Aged Payables by 30-Day Period – displays the amount owed to individual vendors per 30-day aging period (i.e., current debt, 1–30 days, 31–60, 61–90 and over 90 days). • Monthly Aged Payables – displays the amount owed to individual vendors per month. • Daily Aged Payables – displays the amount owing to individual vendors on a daily basis, together with the number of days payment is overdue. • Aged Payables by Invoice – displays all overdue invoices sorted by due date. • Outstanding Invoices – displays all overdue invoices sorted by invoice date. • Open Transactions as of Date – display all invoices that were owed on a specified date. This is useful for viewing the state of the A/P account at any point in the past (e.g., the end of the previous month). A number of reports display purchases from vendors and expenditures on parts purchased during a given period. Most of the reports are based on finalized invoice data, particularly the Purchase Invoice Analysis (OLAP) report, which allows you to analyze purchasing data in a variety of crosssections and formats. An exception is Purch in Period-Incl. Pend. Invs, which is based on both pending and finalized invoices opened during the designated period. Some of the reports are run on a monthly basis (e.g., Monthly Purchases per Vendor); others cover a user-designated period (e.g., Purchases from Vendor in Period). The part analysis reports display quantities purchased in addition to expenditures (e.g., Monthly Purchases by Part). There is also a mechanism for calculating and viewing monthly data on vendor invoices, as well as a report generator for designing your own vendor invoice reports.